Few foods are as irresistible as bacon. A well-cooked strip of bacon (or two or three) tastes of salt and smoke and sweetness, and every crunchy bite creates a craving for another one. Even the fiercest dietary willpower weakens in front of a mahogany pile of hot bacon. It’s the food vegetarians miss most. Bacon makes all kinds of other foods better: What’s tomato, lettuce, and bread without bacon? Or a club sandwich, or a Cobb salad? Bacon transforms a cheeseburger, zips up beef stew and chili, and makes a crisp, savory wrap for shrimp; diced and fried, it’s great on greens or a chilled oyster or a hot chowder, and let’s not forget pizza. Oh, bacon! There are so many ways to love you. Thick-cut. Great if you like a hefty crunch; good for dicing or slicing before frying, to top soups and salads; about 16 slices in a pound. Thin-cut. Makes the crispest possible morning slice; about 32 slices in a pound. Center-cut. Has a greater percentage of meat to fat than ordinary bacon does. Slab. The whole cured pork belly, sold unsliced. Canadian bacon. From the back (loin) of the pig; very lean; sold precooked. Pancetta. Italian bacon, cured with salt and spices but not smoked. Chinese bacon (lop yuk; sold at Chinese butcher shops and some markets). Air-cured with soy sauce, sugar, and spices like star anise and Sichuan peppercorn. It’s usually not eaten on its own, but used in small chunks to flavor other dishes. Next: eating bacon responsibly: Can it be done? Let’s face it: The breakfast bacon we know and love ― American-style pork-belly bacon, crisp and juicy ― has a fair amount fat: 3 grams per 8-gram strip (70% of its total calories). Have 3 pieces of bacon with your eggs and skip the peanut-butter chocolate ice cream shake you were thinking about having after lunch. And, if you’re really worried, have salad for lunch, with a piece of toast on the side, hold the cheese. Bacon is high in cholesterol and sodium and is often preserved with nitrates and nitrites (which can produce potentially carcinogenic compounds when cooked). You might not want to eat it every day. But that’s between you and your bacon. We’ll happily eat regular supermarket bacon, but the bacon we love most is the the old-fashioned, dry-cured stuff. Here’s the difference: many mass-produced bacons begin with a frozen thawed pork belly that is injected with a quick “cure” (water, salt, sugar, sodium phosphate, and sodium nitrite) to plump it up. Liquid smoke is added for a smoky flavor, and sometimes sprayed over the surface of the meat, too. The bellies are heated to kill bacteria, then chilled and machine-pressed into standardized shapes and sizes. A small-batch bacon starts with fresh meat, rubbed with salt, sugar, sometimes herbs, and sodium nitrate or saltpeter. It’s left to air-cure for up to a month, and then slow-smoked over aromatic woods. The result is an intensely porky, smoky, meaty bacon that tends not to shrivel when it’s cooked. Here are some recommendations. Please write to us with yours! Very meaty, with a sweet suppleness; from Carlton Farms, founded in 1956 in the foothills of the Oregon Coast Range. 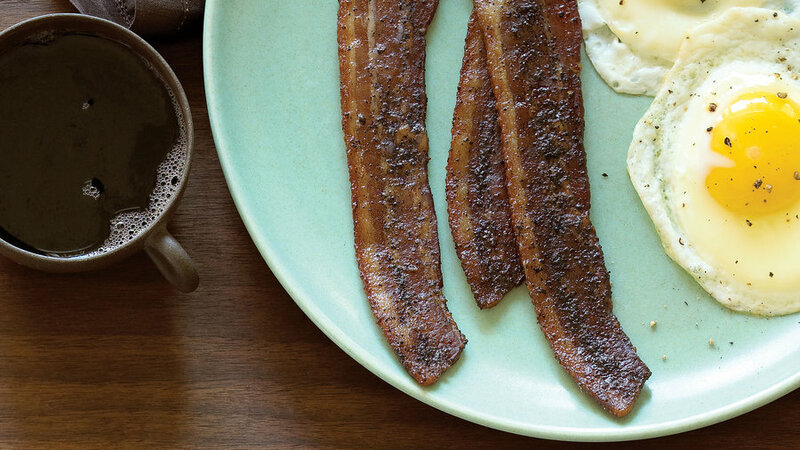 Also, try their dry-cured, alder-smoked Canadian-style bacon―it’s tender, smoky, and delicious. 503/852-7166 or www.carltonfarms.com; prices subject to change, but when we last checked, the dry-cured was about $15/lb. and the Canadian $13/lb., plus shipping. Smoked for 16 hours over applewood chips; a favorite of chefs throughout the San Francisco Bay Area for decades. The bacon is made at the Hobbs smokehouse in El Cerrito, but is sold and distributed through Bryan’s Meats, San Francisco (order by phone: 415/752-3430; ask for Peter or Albert). A 1-lb. package is $8.50, plus shipping. Slow-smoked to a rich, deep brown, just as it was back in 1922, when first fired up its smokehouse in Bishop, CA, in the High Sierras. 2 lbs. for $16.95, plus shipping; half slab (4 lbs.) for $27.95; great Canadian bacon, too ($11.95/lb., plus shipping). Ships within California only; 888/624-6426. Available both cured and uncured. From humanely raised Iowa hogs; the uncured has no added nitrates or nitrites (it’s cured with celery juice). Very meaty, smoky, and flavorful. 12-oz package for $6.98, plus shipping; order through the Niman Ranch partner, , 888/206-3327. Niman Ranch bacon is also available at Trader Joe’s and (in a sampler package) on Amazon.com. Through this bacon-laden food and wine mail-order catalogue, based in Fairfield, CA, you’ll get some of the best bacon you’ve ever tasted, including some of the other bacons on this list. Owner Dan Philips dedicates himself to unearthing handcrafted bacons from all over the country, including the West (he once estimated he’s tried 600 different bacons). A bacon sampler of four types is $42.95; you can also order single bacons (prices begin at $7.95/lb.). Or, go whole hog and join his Bacon of the Month club for porcine prizes like Summerfield Farms bacon, a four-pound slab out of Virginia cured with salt, brown sugar, and molasses that is so meaty it’s almost like brisket. $190 for 6 monthly deliveries of bacon, including shipping, handling, and some great free kitsch (like a bacon comic strip and a strap-on pig nose); $315 for 12 months. 888/472-5283 or .